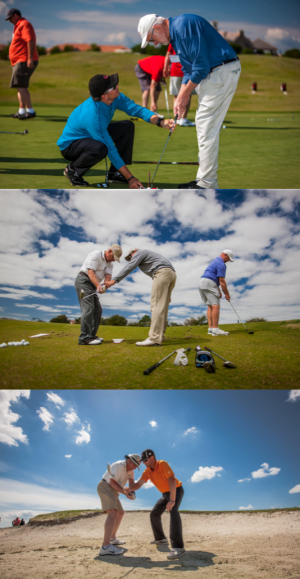 The GGA 2 Day Short Game School is a school designed for the purpose of helping you score. Focused entirely on the short game, students are immersed in instruction around the scoring areas of the game; putting, chipping, pitching, and bunker. First, you must be convinced that the short game is the most important part of scoring. Here are a couple facts about the short game. The difference between a 30 handicap golfer and a scratch golfer (0 handicap) is associated with 7 to 10 shots in the long game (shots over 50 yards) and 20 to 23 shots in the short game (shots under 50 yards). Meaning, if you are a 30 handicap golfer and only work on your long game you will only improve 7 to 10 shots toward scratch golf. The best you will ever reach is a 20 handicap. The difference between a 15 handicap golfer and scratch golfer is associated with 3 to 5 shots in the long game, and 10 to 12 shots in the short game. In other words, if you are a 15 handicap golfer wanting to reach scratch, if you only work on the long game, you will basically never improve beyond a 10 handicap. This School is unique in the fact that it will only cover Short Game.